According to 6Wresearch, China Diesel Genset market is projected to touch $5.3 Billion by 2021. Diesel genset with rating 5KVA-75KVA accounted for key share of the market pie due to its affordability and usage in various applications. Amongst all applications, commercial and industrial captured majority of the market share. However, industrial application sector is expected to witness higher growth over the next six years, due to expansion of manufacturing sector and increasing demand to supply back-up and continuous power. 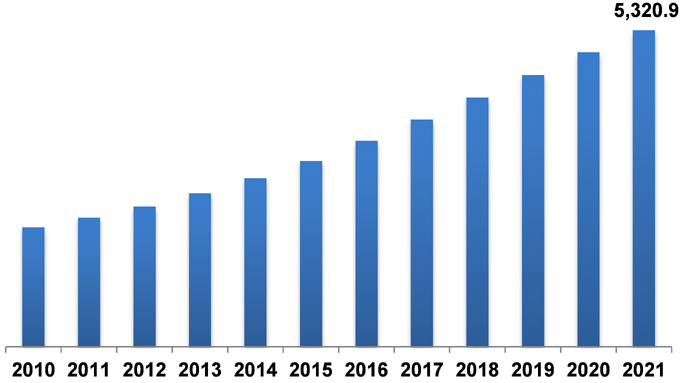 • Market Size & Forecast of Global Diesel Genset Market Volume until 2021. • Historical data of China Diesel Genset Market Revenue by KVA Rating for the Period 2010-2014. • Market Size & Forecast of China Diesel Genset Market Revenue by KVA Rating until 2021. • Historical data of China Diesel Genset Market Volume by KVA Rating for the Period 2010-2014. • Market Size & Forecast of China Diesel Genset Market Volume by KVA Rating until 2021. • Historical data of China Diesel Genset Market Revenue by Application for the Period 2010-2014. • Market Size & Forecast of China Diesel Genset Market Revenue by Application until 2021. • Historical data of China Diesel Genset Market Revenue by KVA Ratings by Application for the Period 2010-2014. • Market Size & Forecast of China Diesel Genset Market Revenue by KVA Ratings by Application until 2021. • Historical Data of China Diesel genset Market Revenue by Regions for the Period 2010-2014. • Market Size & Forecast of China Diesel genset Market Revenue by Regions until 2021. China diesel genset market is expected to grow on account of growing government spending on infrastructure projects across under developed region such as Xinxiang and Tibet, construction of high speed railways network, port and airport projects, expansion of existing industrial base throughout China and increasing the export of various Chinese products in international markets. Small ratings gensets and medium ratings gensets account for largest chunk of revenue in China's diesel genset market. In China diesel genset market, commercial and industrial application accounted for largest of the revenue share, owing to existing manufacturing units expanding to other parts of China and dedicated ‘Made in China' initiative launched by Chinese central government. These developments would boost the demand for all ratings diesel gensets in the country. On the contrary, residential sector deploys small ratings diesel gensets for backup power. The report estimates and forecast overall China diesel genset Market by revenue & volume and by KVA ratings. The report segments diesel genset market by applications such as commercial, transportation, commercial offices, industrial, retail, hospitality & healthcare, banking & financial. The report also gives insights price trends, market trends, company profiles, market drivers and restraints.